Objective: This study investigates the incidence of auditory alterations and traces the audiological profile in children assisted at the Centro de Estudos da Educação e da Saúde. Method: Audiological findings from 150 children aging between 5 and 10 years (average age 7.3 years) were investigated. Data from audiological anamnesis, pure tone threshold audiometry and acoustic immittance measurements were obtained. Results: The anamnesis findings revealed the following complaints: otitis history (58%), otorrhea (22.5%), upper airway infections (13.5%), palatine tonsillitis (10%) and adenoidal hypertrophy (8%). The pure tone threshold audiometry results revealed that 93 children had normal hearing thresholds, 36 had bilateral hearing loss and 21 had unilateral hearing loss. Regarding the type of hearing loss, forty eight had conductive, seven mixed and two sensorineural. Acoustic immittance measurements were also tested in 142 subjects. From the total of ears evaluated, acoustic immittance measurements type A were identified in 154 (54%) ears, type B in 71 (25%), type C in 36 (12.5%), type As in 12 (4.5%) and type Ad in 11 (4%). Conclusion: the audiological profile indicated that 96.5% of cases with hearing loss, conductive or mixed components were observed. In addition, in 63% of these cases, the hearing loss was unilateral or a minimum degree of hearing loss was presented in at least one ear. Regarding configuration, horizontal, ascendant and irregular curves correspond altogether to 90.5% of the examined ears. Mild hearing loss might not be noticed during childhood, when ear problems and other alterations that affect hearing ability. Therefore, it is important to be aware of it, thus childhood represents an important period for the learning development. The otitis media, a common infant disease, should be understood as a basic health problem. In this manner, procedures regarding its identification and treatment should be applied early. Preventive actions would supply better health condition for such a population, by preventing hearing loss and its severe consequences (1). The World Health Report (2) describes hearing loss as a serious problem due to its influence on the language development in children as well as to its impact on school life. The relation of hearing loss in children, due to disorders in the middle ear that damaged the reading ability, showed that the performance of such ability was not affected in children who were healed of otological alterations. Yet, the development of children with non-healed chronic otitis was worse if compared to the healthy children group (3). A revision study on the impact of the otitis media on children's language acquisition reported that the main alterations were: phonetic errors; speech articulation disorders and difficulty in reading comprehension (4). There are several risky factors that can develop middle ear pathologies. They can consist of family antecedent (5), nutrition condition and climate changes (6). The chronic otitis media is the main cause of hearing loss in developing countries (7) and it can lead to other severe complications such as mastoiditis and encephalitis. Histopathological studies on otitis media have shown the possibility of diffusion of bacterial toxins and cytokines from the middle ear to the cochlea through the membrane of the round window (8,9), which would cause ultrastructural injuries in the inner ear such as rupture of the cochlear membranes (10). Despite the fact that conductive hearing losses are responsible for most cases of auditory alterations in children, sensorineural losses have also been studied by researchers who are concerned about the auditory rehabilitation of these children (11). Although progressive sensorineural loss in children is diagnosed as a rare clinical manifestation, it is often bilateral and asymmetric, and hereditary succession is its main cause (12). Auditory thresholds in high frequencies in children with bilateral otitis media with effusion history were investigated, and the results do not show any statistical significant difference between the thresholds of the right and left ear (13). Other authors (14) found 0.88% of prevalence of mild sensorineural hearing loss in school-age students in the city Melborne. In this study, the following values were considered in order to classify losses: average between 16 and 40 dB on frequencies of 500Hz; 1 and 2 kHz and/or in frequencies of 3, 4 and 6 kHz. There are few epidemiological studies on the prevalence and on the impact of the chronic otitis media in Brazil. A study on school-age children, living in the city of Belo Horizonte, showed 0.94% occurrence of otitis media; otitis complaint was reported in 8.4% of the cases; and 7.7% of the children presented otorrhea history (15). The Campanha Nacional da Audição (Auditory Campaign) reports that between 10 and 15% of the school-age children have mild and fluctuant auditory disorder; 2% carries losses that require the use of hearing aid (16). Due to the fact that otitis media with effusion is sometimes asymptomatic, its diagnosis depends on the tympanometry test. A comparative study was done with 141 school-age children. Twelve of them were diagnosed through audiometry and tympanometry tests; nineteen ears presented otitis media with effusion, and only four ears were identified when only audiometry test was performed (17). A total of 121 students (242 ears) from the city of Goiânia were examined through anamnesis, audiometry and immitanciometry tests. The threshold were considered 'normal' up to 15dB and 'mild hearing loss' was considered up to 25dB. The cases in which hearing losses occurred, the curve configuration was plane (horizontal). 184 ears (76%) presented normal threshold and 58 of them (24%) presented altered audiometry. The most frequent alterations were mild conductive and mild sensorineural hearing losses in 26 ears (12%) and in 15 ears (7%) respectively. The achieved tympanometric curves were: type A in 230 ears (94%); type B in 6 (3%) and type C in 6 ears (3%) (18). The prevalence of chronic purulent otitis media in students aging from 5 to 12 years, from Vale Katmandu, was also researched. Findings indicated that 5.7% of public school children x 4.8% of private school children had otitis media. The author considers that sanitation education, socioeconomic improvement and sanitation infrastructure are important factor for reducing the occurrences of chronic purulent otitis media (19). A comparative study between audiometric configuration of children and adults classified curves as ascending, descending, horizontal and 'U' form. In general terms, hearing losses in children were equally distributed among the mentioned categories, while the descending and 'U' form curves prevailed in the grown-up audiograms. 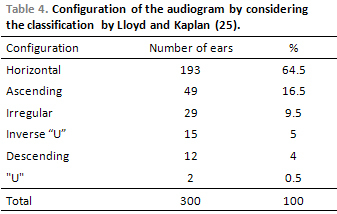 This confirms the existing differences in audiological features in different ages (20). Regarding the importance of reporting the real auditory health in children, this study aimed to research the occurrences of auditory alterations and trace an audiological profile in children, aging from 5 to 10 year, who were assisted in the Centro de Estudos da Educação e da Saúde in the city of Marília - SP. This study was done in the Clinical Audiology Department of the Centro de Estudos da Educação e da Saúde (CEES) with the approval of the Research Ethics Committee of the Faculdade de Filosofia e Ciências da UNESP, Campus - Marília - SP (nº 795/05). The authors researched audiological data of the 150 children's medical reports assisted between 2005 and 2007; 83 of them were male and 67 were female, aging from 5 to 10 year (average 7.3). - Immitanciometry test with the use to GSI 61 Grason - Stadler. Tympanometry was considered in the analysis of the acoustic immitance of the middle ear. This procedure helped to evaluate functional integrity of the tympano-ossicular set (22). Data was analyzed according to audiometric findings: degree (23); type of hearing loss; configurations (24); and asymmetries between tight and left ears (statistical analysis through ANOVA test). The Logoaudiometry test supplied data to confirm audiometry findings and to help on the topodiagnosis (21). 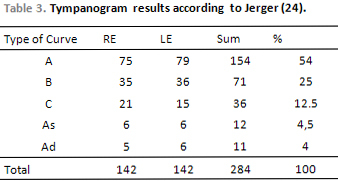 The results of the tympanogram test were classified according to Jerger (25). The audiological anamnesis results showed that the major symptoms and/or complaints identified in this study were related mainly to conductive or mixed alterations, which could be either by the direct involvement of the auditory system such as the cases of otitis (n=87 / 58%) and otorrhea (n=34 / 22%) or by the possible interference on the auditory tube activity caused by upper airway infections - UAI (n=20 / 13%); amigdalitis (n=15 / 10%) and hypertrophy of the adenoid (n= 12 / 8%). The evaluated cases in this study did not present any alterations and/or obstruction of the external acoustic meatus that could interfere on the results of the audiological evaluation. The classification by Northern and Downs (23) was applied to research data of the threshold tonal audiometry, by considering the degree of the hearing loss. The classification consider the following values to the average of the speech frequencies (auditory level): normal - from 0 to 15dB; minimal loss - from 16 to 25 dB; mild loss - from 26 to 40 dB; moderate loss - from 41 to 70 dB and severe loss - from 71 to 90 dB. The analysis of the audiogram, based on the total number of the cases (Table 1), revealed 93 (62%) children with normal auditory level and 57 (38%) with auditory alterations. Among the children who presented reduced hearing (n=57), 36 (63%) of them had bilateral type and 21 (37%) unilateral. In 36 (63%) children, hearing loss was either unilateral or presented minimal degree, at least in one ear. Still concerning the cases which had alterations, 55 (96.5%) of them presented conductive component. Among these, 48 (84.25%) cases were conductive, 7 (12.25%) were mixed and only 2 (3.5%) cases were diagnoses as sensorineural hearing loss. Significant differences between the threshold averages of the right and left ear were noticed (Table 2). The immitanciometry test was performed in 284 ears (except for 8 cases). 54% of the cases presented normal result to the middle ear (curve type A); 46% presented results that suggested alteration on the tympano-ossicular system, which could be associated to conductive or mixed hearing loss (curves type B, C, As and Ad), according to Table 3. Concerning the classification of the audiometric curve (Table 4), there was predominance of the configurations with horizontal, ascending and irregular forms. These forms, when together, correspond to 90.5% of the researched ears. Auditory alterations in children must be early identified and remedied, as hearing loss can interfere on the language development, having as consequences phonetic errors in speech production as well as reading comprehension difficulty (4). This study could identify 93 cases in normal condition and 57 with hearing loss, with prevalence of the conductive type. The data presented in the audiological anamnesis was also related to the conductive profile, as the main complaints were otitis, otorrhea, upper airways infections, amygdalitis and adenoid hypertrophy. The literature that was studied highlights otitis media as the most common disease in children (1), and refers the conductive alteration as the cause for most cases of hearing loss in the same population (11). Seven cases (4.6%) were diagnosed as mixed hearing loss, which was related to recurrent otitis media. These cases were likely to have injuries in the inner ear due to the worsening of these infections (8-10). Literature reports that sensorineural hearing loss is a rare alteration in children (12). This study agrees with that, as only two cases were diagnosed as sensorineural loss. One of them had meningitis history and the other cases of hearing loss in the family. 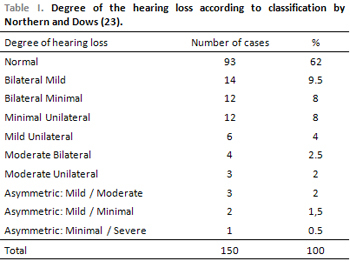 Regarding the degree of hearing loss in the group which suffered alterations, 36 (63%) cases had either unilateral loss or presented minimal degree of loss, at least in one ear. This information is important to health and education professionals, as there is the need of an early specific evaluation before any suspicions of hearing loss. This allows an early diagnosis and treatment of the auditory alteration with the purpose of avoiding damages related to language development (4). Regarding the configuration of the audiometric curve, there was prevalence of the horizontal, ascending and irregular forms, which are related to the conductive hearing loss (21). However, another study found different results, as there was no prevalence of a specific configuration and hearing loss in children presented audiometric curves evenly distributed in ascending, descending, horizontal and "U" forms. This difference occurred due to the fact that the authors only consider sensorineural losses to classify the curves (20). 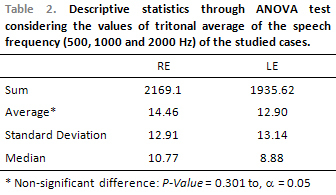 There was no statistical significant difference when comparing the audiological threshold between right and left ears, as well as in the findings by Ferreira et al. (13). According to Jerger (25), the tympanometric curves of type A are found in individuals with middle ear in normal condition, while curves of type As refer to rigidity and curves of type Ad refer to a flaccidity of the tympano-ossicular system. Curves of type B are found in individuals with fluid in the middle ear and curves of type C refer to the alterations of the auditory curve. Once this study presented 46% occurrence of curves type B, C, As and Ad, which can be related to alterations in the middle ear and/or in the auditory tube, we understand that data was compatible with the types of the most frequent hearing losses presented in this study - conductive and mixed hearing losses. By considering the works by Yockel (17), we agree that the tympanometry test is crucial to precisely diagnose the conductive alterations, once the main purpose of this study is to evaluate the integrity of the tympano-ossicular system. Based on the analysis of the results, it was possible to characterize the audiological profile of the children who were assisted at the Centro de Estudos da Educação e da Saúde. Regarding the type of hearing loss, 96.5% of the altered cases presented a mixed or conductive component; 63% of these cases refer to either unilateral loss or loss of minimal degree in one ear at least. Regarding configuration, horizontal, ascending and irregular curves, together, correspond to 90.5% of the researched ears. In the presence of this data, professionals who directly work with children should be informed about the preventive aspects related to auditory system, by aiming to early find unilateral and/or minimal losses that interfere on the language development of a child. 1. PhD (Doctor Assistant Professor). 2. Bachelor of Phonoaudiology (Phonoaudiologist). This article was submitted to SGP (Sistema de Gestão de Publicações) of R@IO on April 14th, 2008 and approved on July 26th, 2008 at 20:03:08.